Welcome to Y.E.A.H. Info! This site has resources and information for teens and young people experiencing homelessness in Philadelphia. There are many different topics on this site, with information such as how to find a free meal, where to take a shower and find clean clothes, housing information, nearby clinics, general health information, job opportunities and support to apply for jobs, and so much more. Please leave a comment if there is something that you cannot find, or if you have information that we can share with others. Please note that this site is not regularly monitored. The sources included are also not verified sources. 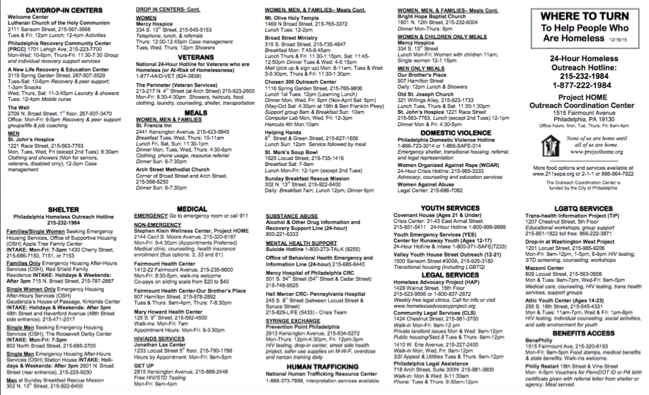 For immediate help finding resources, please call United Way at 2-1-1 or 1-866-964-7922. Help is available 24/7. For a printable guide of select resources, please click here to view Project HOME’s Where to Turn Guide. Thank You to The Keith Haring Foundation for permitting use of the Keith Haring “We The Youth” mural on this site. The mural was originally created in 1987 in collaboration with CityKids of New York and Brandywine Workshop in Philadelphia. The mural was recently restored in 2013 by the City of Philadelphia Mural Arts Program in partnership with The Keith Haring Foundation. This site was created by Graceann Palmarella, MPH, with support from the University of Pennsylvania’s Center for Public Health Initiatives.